Lined with beautifully restored traditional shophouses and blissfully free of the overhead power lines that mar the rest of Kyoto, Sannen-zaka and Ninen-zaka are a pair of pedestrian-only lanes that make for some of the most atmospheric strolling in the whole city. 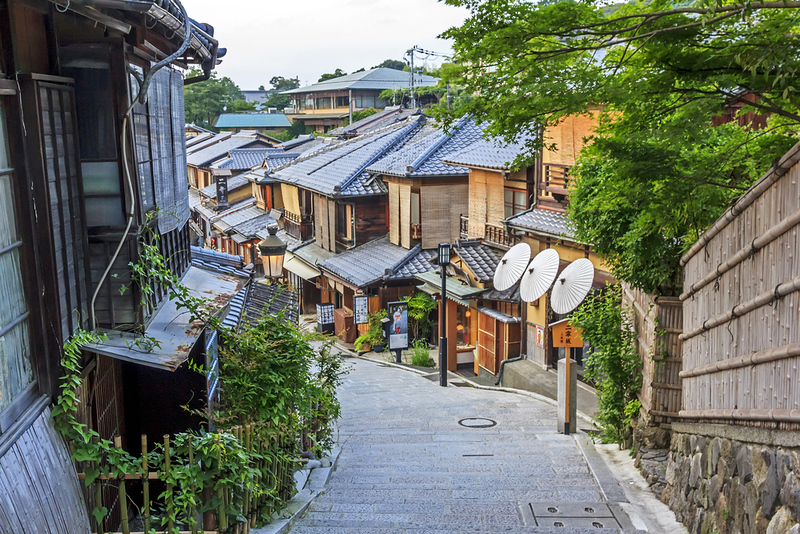 In fact, it’s here that you are most likely to be able to imagine what Kyoto looked like before modernity descended in full force. You’ll find plenty of restaurants and teahouses to refresh yourself as you explore, including the single most atmospheric teashop in the city Kasagiya. The only caution is this: During cherry blossom season, these two hills will be utterly crammed with people. In this season (and any other time of year), an evening stroll is highly recommended. Ninen-zaka and Sannen-zaka Preserved Districts is located in Kyoto’s Southern Higashiyama district. See our complete list of things to do in Southern Higashiyama, including places to eat, nightlife and places to stay.